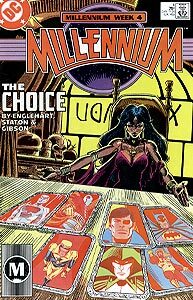 Cover Description: The mystic Madam Xanadu sits at a table with 7 upturned cards revealing (from left to right, back row) Captain Atom, Deadshot, Rick Flag, Batman, (front row) Booster Gold, Spectre, and Firestorm. Brief Synopsis: The Oans have gathered 8 of their Chosen, but the Manhunters' offensive against them begins to gain ground. Issue Notes: This is the key book in the fourth week of the two-month long Millennium crossover event. So far as Batman is concerned, when Booster Gold decided to join the Manhunters, he "went bad." Booster and Batman will once again work together in the Justice League, but their relationship will not quickly recover from this breach of trust. The Manhunters tell Booster of their immediate plans to test his loyalty. He acts completely indifferent to their schemes. This is the last appearance of Dirk Davis for several years (until Extreme Justice #6). Boosterrific Review: This latest episodic installment of the Millennium saga is a refueling at the story's midpoint. Old plotlines are tied off, and new ones are established. This issue is not so much space-holding filler as it is a juggler trying to keep the balls in the air for the many crossover events that depend on the pacing and guidance that this steady-handed mini-series is providing. Millennium simply did not work, as this issue shows.